One of the most difficult and most critical parts of implementing data science in business is quantifying the return-on-investment or ROI. In this article, we highlight three reasons you need to learn the Expected Value Framework, a framework that connects the machine learning classification model to ROI. Here are the 3 reasons you need to know about Expected Value if you want to tie data science to ROI for a machine learning classifier. We’ll an example related to employee churn (also called employee turnover or employee attrition). F1 is the threshold that harmonically balances the precision and recall (in other words, it optimally aims to reduce both the false positives and the false negatives finding a threshold that achieves a relative balance). The problem is that, in business, the costs associated with false positives (Type 1 Errors) and false negatives (Type 2 Errors) are rarely equal. In fact, in many cases false negatives are much more costly ( by a factor of 3 to 1 or more!). We develop a prediction algorithm that finds employees are 5X more likely when work too much overtime. We develop a proposal to reduce overtime using the extremely powerful H2O classification model along with LIME, which explains the results. Like many algorithms, by default we optimize by treating Type 1 and Type 2 errors. This ends up misclassifying people that quit (Type 2 error) at roughly the same rate as we misclassify people that stay as leave (Type 1 error). The cost of overtime reduction for an employee is estimated at 30% of the lost productivity if the employee quits. However, the cost of reducing the overtime incorrectly for someone that stays is 30% or 3x more costly than Type 1 Errors, yet we are treating them the same! The optimal threshold for business problems is almost always less than the F1 threshold. This leads us to our second reason you need to know the Expected Value Framework. When we have a calculation to determine the expected value using business costs, we can perform the calculation iteratively to find the optimal threshold that maximizes the expected profit or savings of the business problem. By iteratively calculating the savings generated at different thresholds, we can see which threshold optimizes the targeting approach. 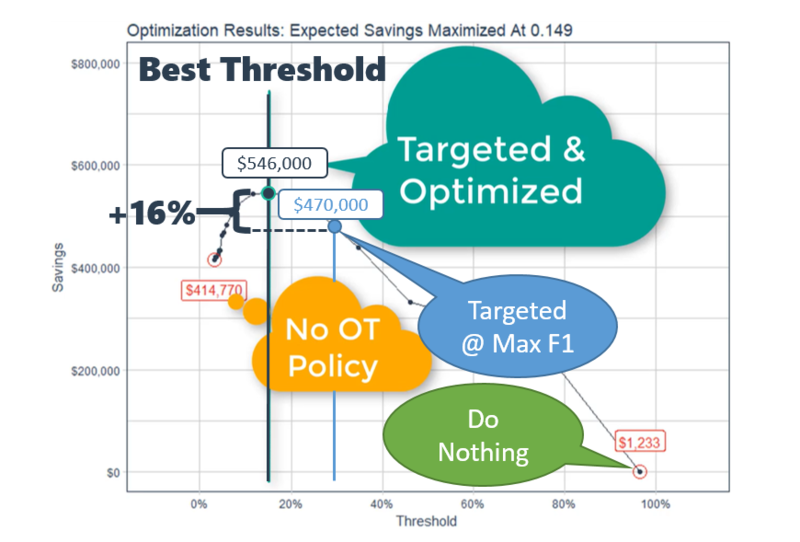 In the detailed example, we can see in the threshold optimization results that the maximum savings ($546K) occurs at a threshold of 0.149, which is 16% more savings than the savings at threshold at max F1 ($470K). It’s worth mentioning that the threshold that maximizes F1 was 0.280, and that for a test set containing 15% of the total population it cost $76K due to being sub-optimal ($546K - $470K). Extending this inefficiency to the full population (train + test data), this is a missed opportunity of $500K annually! However, the model is based on a number of assumptions including the average overtime percentage, the anticipated net profit per employee, and so on. In the human resources example below, we tested for a range of values average overtime percentage and net revenue per employee because our estimates for the future may be off. 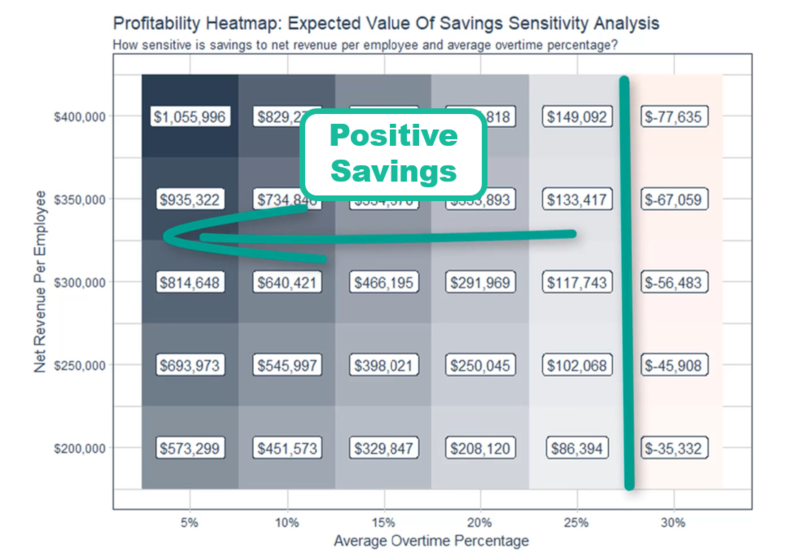 In the Sensitivity Analysis Results shown below, we can see in the profitability heat map that as long as the average overtime percentage is less than or equal to 25%, implementing a targeted overtime policy saves the organization money. Wow! Not only can we test for the optimal threshold that maximizes the business case, we can use expected value to test for a range of inputs that are variable from year to year and person to person. If you’re interested in learning how to apply the expected value framework for your business, we show you how, provide code, have a video, and show you other industries where this may apply on Business Science University.